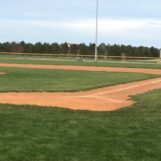 Scott City, Kan. (westernkansasnews.com)–Coming off their first doubleheader sweep of the year on Thursday, the Scott City baseball team was looking to continue their momentum on Tuesday at home against Colby in a GWAC doubleheader. It would be a tall task, and a tough one, as the Eagles would sweep the doubleheader, winning 11-3 in the first game, and completing the sweep with a 10-0 win in five innings in the second game. Colby would score in six of the seven innings, with just two of the innings having a multi-run inning. The Eagles put up a run in the first, two in the second, and added runs in the third, fourth and sixth innings. Scott City would pull to within 5-1 in the fourth, before the run in the sixth made it 6-1. Colby exploded for five runs in the top of the seventh to take an 11-1 lead. The Beavers scored two in their final at bat, as they fell 11-3. Tucker Branum went 3-3 with five RBI in game one, including a three-run triple in the seventh inning to blow the game open. Gage Winger and Heath Bolyard each had two hits, as the Eagles had 10 for the game. Mason Wright needed 80 pitches in seven innings to get the win, giving up three earned runs on eight hits with eight strikeouts. Harrison King and Jose Trejo had two hits for Scott City, and Kevin Herman, Ronnie Weathers and Ryan Cure each had an RBI. The Beavers finished with eight hits. Herman took the loss, giving up five runs, four earned on six hits and seven strikeouts with five walks in four-plus innings of work. In the finale, it would be all Colby. The Eagles scored in three of the five innings played. In their two scoreless innings, they were retired in order. Colby pushed three runs across in the first, four in the third, and added three runs in the fourth to build a 10-0 lead. After a leadoff walk in the Scott City first, the Beavers were retired 14 consecutive times, and only reached base two times. J.T. Zerr pictched a no-hitter with 10 strikeouts and one walk in five innings, throwing just 58 pitches. He also helped his own cause by driving in four runs with two hits. Colby had just five hits in game two, waking seven times. Scott City’s Harrison King struggled, going two and a third inning, giving up five earned runs on three hits. Easton Lorg reached base on a walk and Ryan Cure reached on a third strike passed ball. The Beavers committed three errors in game two. After Tuesday, Scott City dropped to 3-7 overall, 1-3 in GWAC play, as they have a week off before visiting Hugoton next Tuesday. Colby improved to 4-3 overall, 4-0 in league play, as they are scheduled to host Burlington on Thursday for one game.